Every time I go out to eat at a nice restaurant, I order seafood. This has become a standing joke with my husband and I. We play the “let’s guess what Trish is going to order” game. If there’s a piece of fish sitting on top of a vegetable on the menu, I order it; probably because I don’t cook it much at home. I’m not too adventurous in the seafood cooking department. Without much experience preparing it, the last thing I want to do is screw up a $15 piece of fish. You know how disappointing it can be to make a special trip to the store for something, come home, spend an hour cooking and want to toss the final result right out the window. But, in the name of trying new things and teaching myself to not turn into a raging lunatic if everything doesn’t come out as planned; I made a trip to the seafood counter. 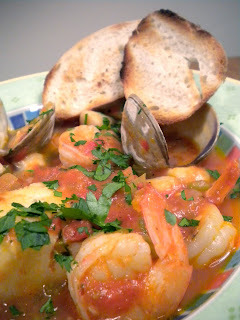 I was visiting with my family over the weekend and remembered my Mom making this great fish stew when I still lived at home. Now that I’m all grown up, I don’t have the luxury of getting mom-cooked meals 24/7. Let me tell you, it’s a major bummer. 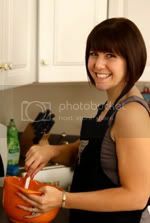 She’s the best home cook ever. But I digress. This delicious fish stew is called Bouillabaisse. Leave it to the French to come up with a snooty title for everything. Sorry to spoil the mystery here, but it’s just fish stew. Have you ever tried asking a mom how they make one of their specialty meals? “I add a little of this and a little of that, the recipe says this but I leave it out, stir until it looks just right.” That’s mom language for “I completely make this up.” Well, isn’t that just great. I’m used to reading recipes, so Mom busted out some cookbooks from the 70’s (copyright 1978, I checked) and I took two different recipes home to review. I’m pretty proud of this dish because I basically came up with it on my own. I just kept adding and tasting until it came as close to Mom’s as I could remember. My husband and I were wildly impressed with ourselves. I didn’t have to diet this up much. This recipe is pretty healthy on its own. I left out any trace of butter and used a tiny amount of olive oil to sauté the vegetables. Instead of serving the stew with a giant roll of Italian bread, I made little crostinis out of a French baguette. I’m sure there are French chefs out there with rather strong opinions as to what classifies as a Bouillabaisse. I’m certainly no French chef. I was just looking for a healthy way to enjoy seafood. Since it's winter here in NY, a piece of grilled fish just didn’t seem hearty enough to do the trick. Feel free to substitute the seafood for whatever looks fresh at the market that day. In the end, this dish felt like eating restaurant food even though it was off a snack tray in the living room of my one bedroom apartment. Also, I took out mom's 1970's version of The Joy of Cooking during that last snow day to make her banana bread (SO NOT dieted-up!) from when we were little. Oh how I love that cookbook with the yellowing pages...it will never leave that shelf. I always wanted that Joy of Cooking book, even if it is from the 70's! Speaking of banana bread, I DO have a diet it up Banana Bread recipe. I might bust that out for the site! Good thinking!